Happy Saturday, friends! Hope you have some fun things planned for this weekend. The weather here in AZ is great so we are headed to my Mom's for a pool day. Then dinner on the patio later with friends. I can't get enough chambray lately. It just screams summer to me. I love my new chambray lemon espadrilles, this darling chambray ruffle sundress (40% off) and the chambray tie-back top pictured here. Chambray is super versatile so you can basically pair it with anything. I love it with white denim, but any color denim, linen, etc, will all look fab. 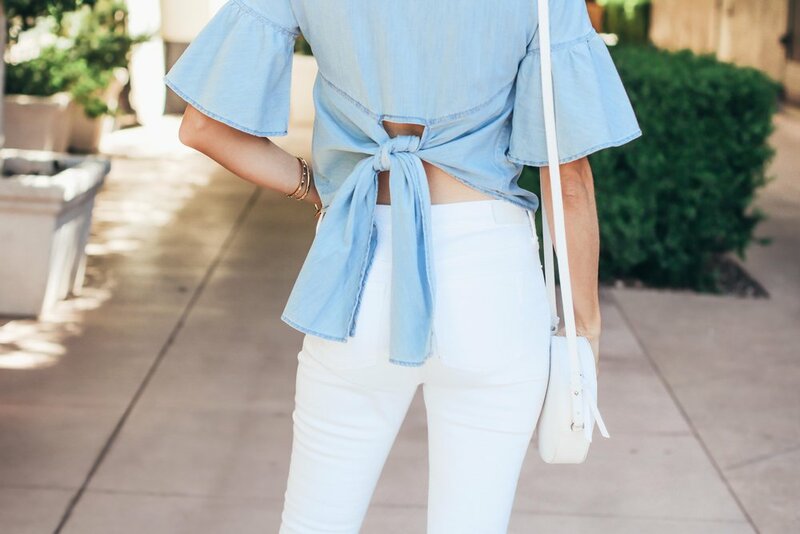 The tie-back and bell sleeve details make this top. My distressed white skinny jeans (fit TTS) and this top (runs large, size down one size) are both 40% off (along with everything else on their site). This weekend only. No code needed.